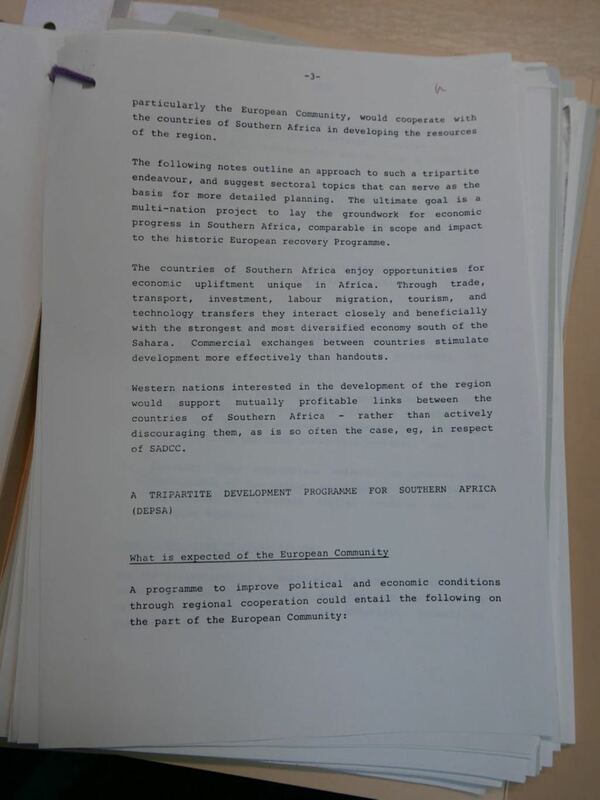 Margaret Thatcher wooed the South African government with promises of a “Marshall Plan for southern Africa” and helped “save” the independence of Namibia, according to newly released papers. The events they cover provide an insight into a March 1989 visit to Britain by the South African foreign minister, Pik Botha. 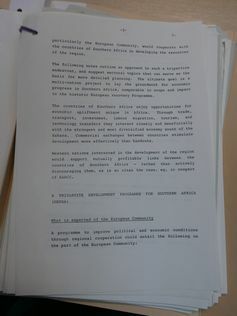 The documents, from the prime minister’s official papers, are now released as part of the regular transfer of declassified material to the National Archive. They shed new light on the British government’s approach to South Africa in the final years of the apartheid regime. 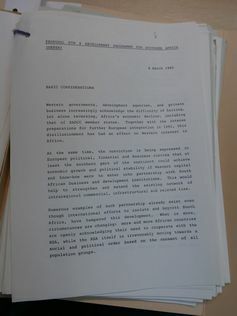 Thatcher’s administration was consistently criticised through the 1980s for supporting the white minority government in Pretoria, declining to impose sanctions on it, and reportedly decrying the ANC as a “typical terrorist organisation”. They also reveal just how serious South Africa’s financial predicament was as it attempted to negotiate an end to apartheid, and how the Thatcher government used the opportunity it presented to entice Pretoria into reforming the country and releasing Nelson Mandela. It did so by proposing a massive aid package for the whole region – a Marshall Plan-style rescue plan to keep southern Africa stable even as South Africa underwent enormous change. This was a critical period for southern Africa. Talks with the African National Congress (ANC) had been underway for five years; negotiations over the future of Namibia – which South Africa ruled – had concluded with plans for the country’s independence. But South Africa, still the major player in the region, was rudderless. In January 1989, South Africa’s president, PW Botha (no relation to Pik) had a stroke, and the following month, FW de Klerk took over as leader of the governing National Party – but he didn’t become president until September 1989. The region was at a crossroads, between peace and continued conflict, and yet South Africa was stuck between leaders. You will want to stress how important it is that the [Namibian peace] agreement should be implemented meticulously. The prospects of avoiding further sanctions at CHOGM [the Commonwealth Heads of Government Meeting] in October will depend very much on progress with implementation of the Namibia Agreement. 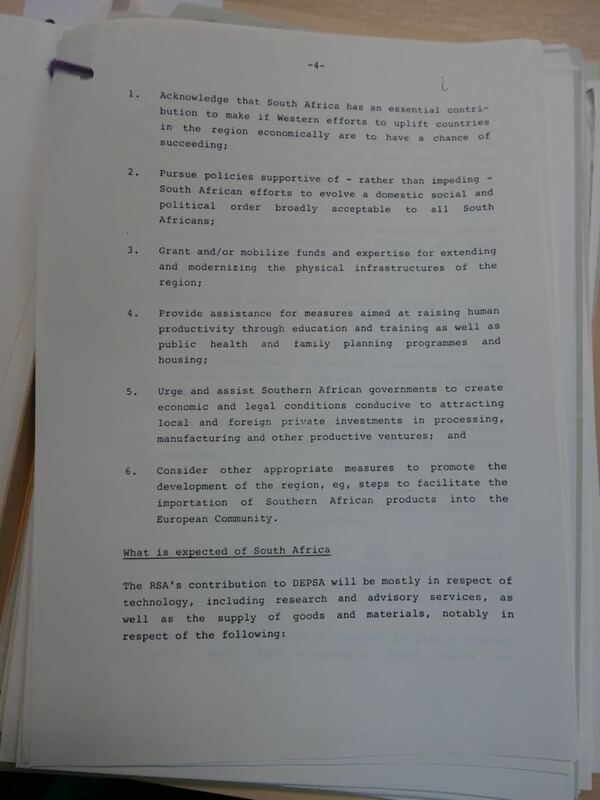 This was what the prime minister did, and Pik Botha did not demur. Indeed, he admitted that it was unclear who would win the independence election, since “South Africa had got the [Rhodesian] elections in 1980 so badly wrong”. Botha conceded that it looked as if the South West Africa People’s Organisation (SWAPO) “would get over 50% but doubted it would reach two-thirds of the vote” necessary to change the constitution. 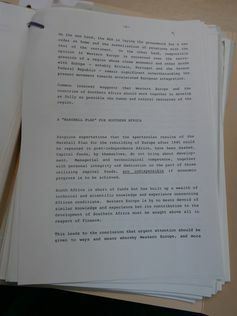 The key issue was whether a trip to what Thatcher described in her autobiography as “Black Africa” in March and April 1989 should include a visit to Namibia. In the end this did indeed take place, although the press pack accompanying the PM was only told once they had taken off from Malawi for the Namibian capital, Windhoek. In flagrant disregard of previous undertakings that no armed personnel would come south of the 16th Parallel (well within Angola) hundreds of SWAPO (South-West African People’s Organisation) troops crossed the border into Nambia with military equipment. I was not in the least convinced by the reaction of the SWAPO leader – Sam Nujoma – who claimed his organisation was faithfully abiding by the cease-fire and that the so-called invaders must be South Africans in disguise. Thatcher met Pik Botha at the airport in Windhoek and persuaded him not to allow South African troops to move out of their barracks unilaterally. In the end they were allowed to confront the SWAPO fighters, but only under the auspices of the UN. There were casualties, but SWAPO was finally escorted back into Angola and a new ceasefire prevailed. The South Africans were on the verge of withdrawing from the settlement … The scene shifted to a long and extremely difficult meeting with Pik Botha at the airport. Under pressure from the military in Pretoria, he was adamant that the South Africans would have to take the law into their own hands and call in air strikes against the SWAPO columns, whether the UN authorised them or not … I argued fiercely against air strikes. If Namibia had been an obstacle in the London talks, Thatcher had a carrot up her sleeve. Overhanging the discussions in London was – of course – the release of Nelson Mandela and the ending of apartheid. In the talks, Thatcher made it clear that “the recent pace of reform had slackened” under PW Botha. She described as Mandela’s freedom as “the crucial step that must be faced”, saying the “down-side risk of not releasing him was enormous”. This was in line with her previous confidential talks with the South African government, in which she had refused to bow to their demands. The documents reveal an extraordinary and little-known proposal to provide aid on an unprecedented scale. Western governments, they say, acknowledge “Africa’s economic decline”; European nations propose to “grant and/or mobilise funds and expertise for extending and modernising the physical infrastructure of the region”. No actual sums of money are mentioned, but calling the proposal a “Marshall Plan” suggests they were very substantial indeed. 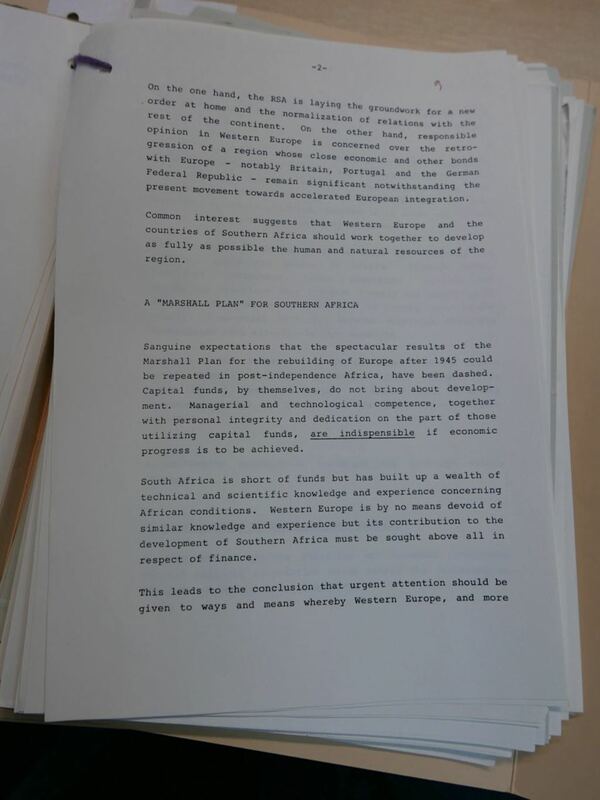 Newly released documents from Margaret Thatcher and Pik Botha’s 1989 meeting. 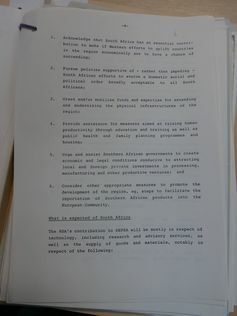 “Pik Botha read the note and commented that he found it very reasonable,” says the minute of the meeting. “He would take it back to President Botha.” The foreign minister described what he called “hesitations” on Mandela’s release in the cabinet, but that the country was “desperate” for “outside financial help”. Nothing has ever come of these promises; no plan, Marshall or otherwise, was ever produced. But perhaps the hope of it was enough to persuade de Klerk to eventually take the step that Thatcher pressed for: to free Nelson Mandela.